VOZIQ’s effort in articulating thoughts on leadership ideas around customer retention was recognized and well received by our fellow readers in 2018. We would like to share with you some of VOZIQ’s most popular blogs of 2018. In case you missed their first publication, we decided to share these blogs again as a recap on how 2018 went by. We hope that you find these insightful! Today, one poor customer service experience can prompt a customer to switch to your competition. According to a Forrester report, customers are increasingly driving up revenue risk, as they don’t mind doing business with competitors if their expectations are not met. So, how can leaders succeed at the retention challenge? If you are in charge of customer retention in a recurring-revenue business, you know that your competition is always trying to poach your customers, and that your customers will jump ship after a bad experience, or in pursuit of a better deal. So what can you do to reduce churn? Reimagining the customer life cycle by introducing a new stage to the life cycle: Safeguard! In case if you are wondering about how to implement the safeguard approach, this blog gives you a variety of insights. Because of the growing importance of customer experience (CX) management in driving revenue, CMOs are making it a priority to work closely with contact center leaders. Most customer-centric CMOs are aware of this fact. The results show that 34% of U.S. CMOs have cited improving CX as their biggest concern. However, when it comes to collaborating with customer service teams, there is a huge difference between collaborative leaders and marketers, who operate mostly within their group without running collaborative projects that join forces with groups like customer care, IT, HR, etc. With the growing competition among businesses in today’s market, the chances of distinguishing your business from your competition is diminishing considerably. But one thing is obvious; every business will try to enhance customer experience, reduce service costs, retain customers, and escalate revenue growth. This blog has several stats and a few predictions about customer retention that will help you recognize what it means for your organization’s future. We hope that these stats and predictions will certainly provide businesses with insights which will help them know their focus area and also help retention leaders to surface with new and innovative strategies for customer retention and overall revenue growth. How Can Telecom Companies Fight Evolving Churn and Boost Company Revenue? Telecommunication businesses have seen the adverse effects of customer churn on company revenue. One of the reasons for this could be that most of the companies have been using traditional churn-prediction models that have been heavily dependent only on the data gathered from transaction histories and demographics, but this method fails to integrate dynamic customer-generated input with real customer needs, wants, and wishes. So, having a churn-prediction model that can leverage customer interactions and is built on the latest technologies, like machine learning and AI, will help companies in analyzing the customer interactions at scale to understand customer behavior. This helps companies gain key insights about the customer that, when effectively utilized, will drive a 2x faster reduction in customer churn and significantly boost company revenue. 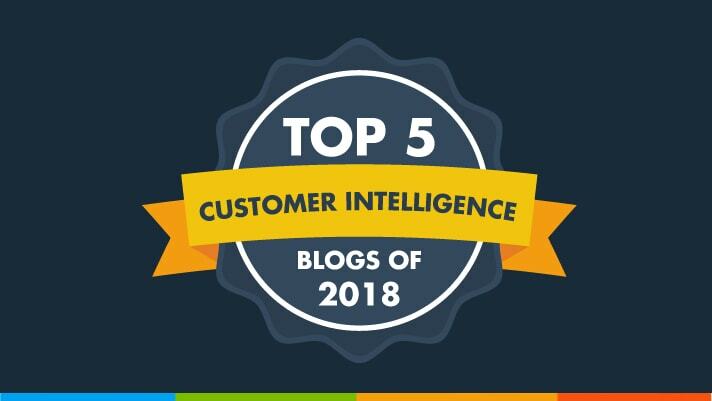 Thank you for taking time and going through our top 5 Customer Intelligence Blogs in 2018. We hope that the insights from our blog posts will inspire you and assist your team in building new strategies that will help your business reach new heights in 2019.